Nothing can beat the concept of trying to improve your life and finding a better way to do things. I have always followed the principle that improvement is not being better than others, but being better than what I was yesterday. Be it in studying, cooking, managing friendships, handling relationships or parenting, I always try to find a better way of doing things. Off course this includes using my tablets as well. Tablets have revolutionized our lives in a great way. The first time I laid my eyes on a tablet, I wondered what is so great about this slab of a computer that looks like the slate I used in my kindergarten school. Soon the question was answered by the tablet itself, as I sat there hooked to the convenient way of surfing internet, watching videos and playing games. It did not take long for the tablet to become the center of attraction in my home, which was earlier ruled by Desktop and laptop. The biggest tragedy of our tablet happened in the beginning itself. We had put the tablet for charging and placed it on our bed. 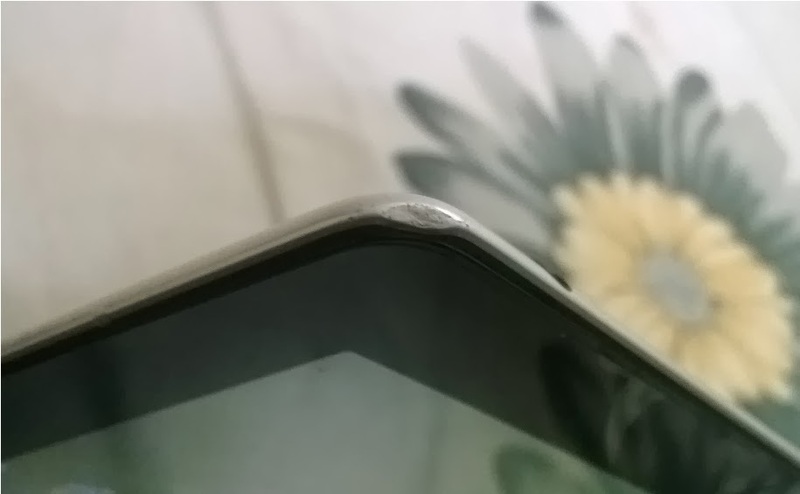 The smooth tablet slowly slipped and fell down, being damaged on the edge and developing a crack on its screen. We were heartbroken and decided to replace the screen. But, the tablet kept working fine and it has been doing so for nearly 3 years now. We decided to continue using it as it is with only adding a cover to give us a better grip to prevent the tablet from slipping away. At present our tablet is wearing its 4th set of cover. 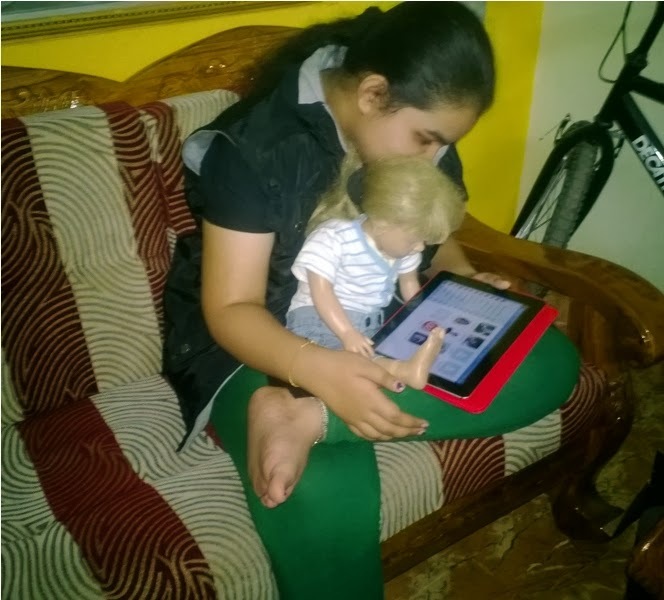 The best part of the tablet was the improvement I could see in my daughter Farheena. 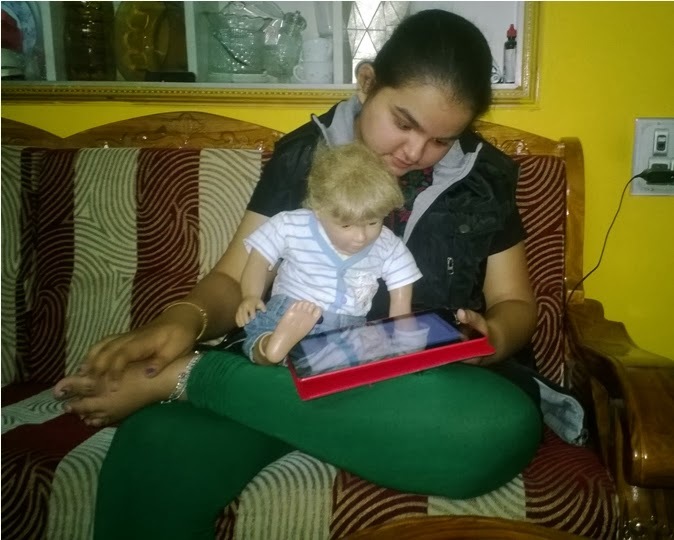 Farheena had developmental issues that troubled her gait, speech and fine motor skills. Her learning was limited as well. One day, as she sat there struggling to write a message; her brother came up with the idea of introducing her to typing. 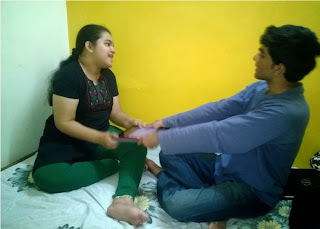 Initially I was reluctant to believe that she could understand and manage the QWERTY keyboard, but the patience shown by her brother soon helped to type her name on computer. That is when I believed she could really do it. With patience, guidance and help, Farheena started surfing internet and keeping in touch with her friends through facebook. 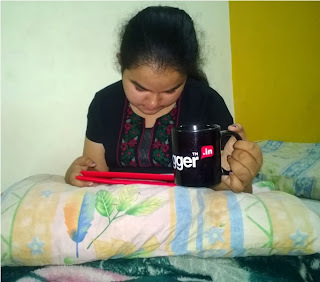 This is when I won a tablet in contest organized for bloggers on Indiblogger. 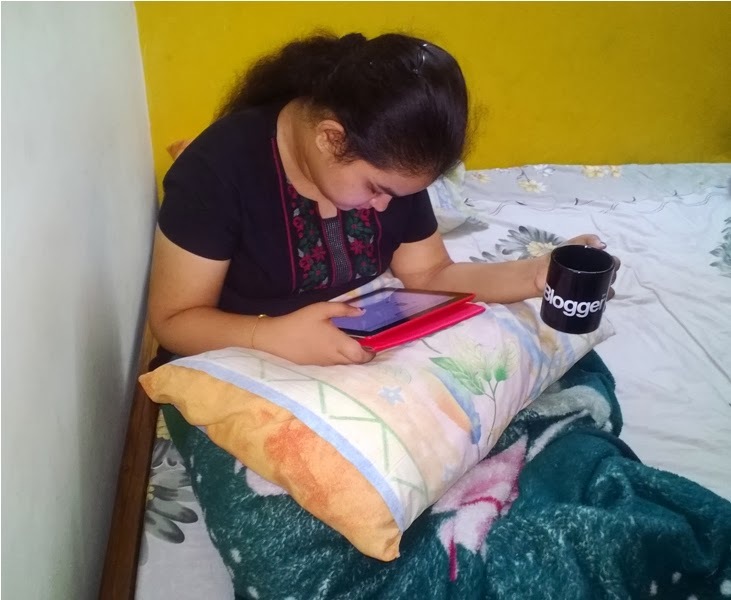 Farheena was so comfortable with the tablet that she totally forgot that we had a Desktop as well. Unlike the PC, she did not require many instructions for using the tablet. 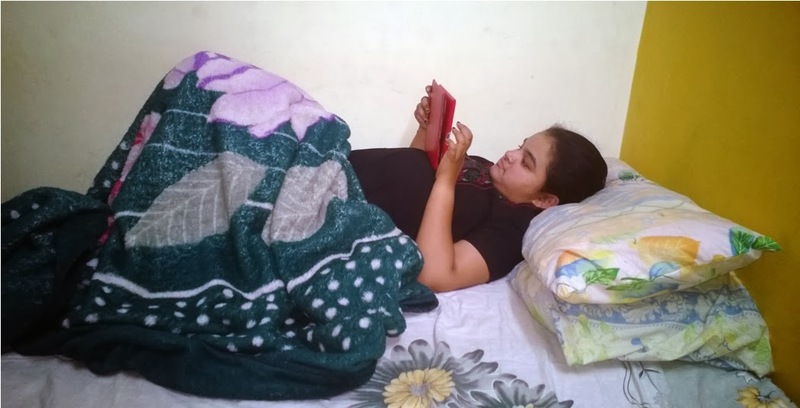 As she was already familiar with facebook, internet search engine and QWERTY keyboard, she could enjoy the time spent with her favorite tablet to the fullest. She knows more about the functions of her tablet than me or her brother, no wonder because she is using it all the time. What the tablet did better than the PC was being a companion to my daughter. She could use the apps for speech development and communicate with her tablet. Also, it had many apps with flash cards that taught her new words and spellings, in the simplest way. 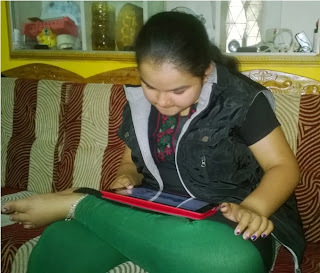 I feel the educational apps, speech development programs and many other functions of the tablet are highly beneficial to people with special needs. 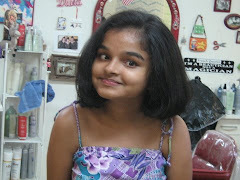 Farheena’s vocabulary and typing improved tremendously after she was introduced to tablet usage. It was surprising to see her play the games like Temple Run, Subway Surfer, Candy Crush and many more like a pro which has improved her eye-hand co-ordination more than any of the medical therapies she has undergone. With Communication tools like facebook chat and Skype the tablet has changed how we communicate with friends. Easy to carry around, the tablets can be used to share an Indian recipe with your American friend as and when you are cooking it in your kitchen. When I received my first tablet, I did not have much choice as to what features or specifications I can look for in it. Today, after using the tablet for more nearly 3 years, I am quite sure what an ideal tablet should have for us! First the 16 GB memory, without an option for any additional memory is not enough anymore with launching of new apps happening every day. I will sure look for Expandable Storage Capacity of 64 GB or more for my new tablet. The flat slates type tablets are difficult to put anywhere when you need your hands free. This happens when I am keeping a recipe open to cook a dish in my kitchen. They often slip and fall, even if you make them steady. It would be so convenient to have your tablet stand somewhere where you can see it easily. A tablet with a stand like the Lenovo Yoga Tablets which sport an extremely versatile design, which enables us to keep it upright, tilted and handheld to video chat or watch that exciting video on YouTube. 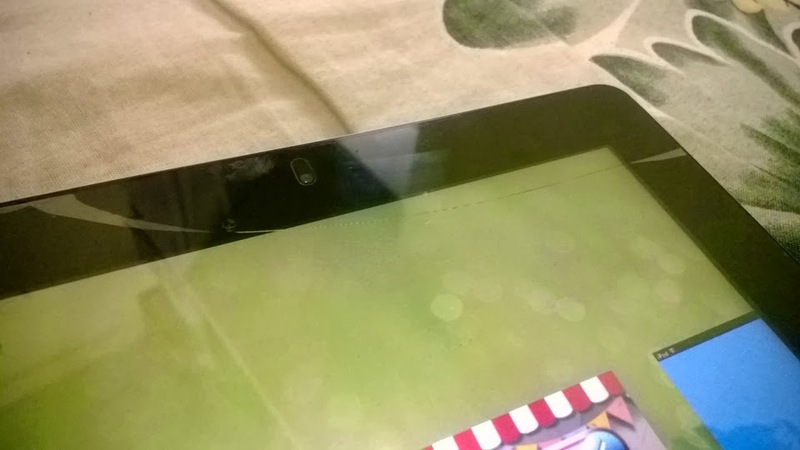 Again, it will not suffer the tragedy of my previous tablet which slipped and fell due to its flat smooth surface. There is no call facility in my tablet, and I know how big a drawback this can be. Though I have my smart phone, at times I feel it would be great to have a SIM slot for my tablet as well. Without my Wi-Fi, there is nothing much I can do on my tablet. Hence, I will definitely look for a tablet that has both the 3G and Wi-Fi connectivity so that I stay connected to internet when I am on the go. In addition the tablet should have features that will allow me to share the data with other devices. Good front and back camera, which allows me to skype or video chat with friends and family, giving out clear images is also desirable in a tablet. The smaller tablets are just like a bigger smart phone, where as too big screen makes carrying it around inconvenient. I look for ideal screen size ranging between 9 to11 inches for my next tablet. The last thing I want is my tablet to go dead in few hours when I am out without a port to charge it in. Since the tablets are carry around PCs, I prefer it to have a long battery life. I do not use the speakers of my tablet often, but when watching certain music videos I love to have good sound effect from my tablet. Good speakers are not a must, but will be an additional bonus feature if it comes with the tablet. There are times when I have to type my mails or articles on the tablet. The touch-screen keyboard hinders my speed to a great extent. A slot that enables me to connect keyboard, USB and other additional devices will be very helpful. Finally I will look for a tablet that stands out in its look and is different from all the tablets hitting the market. I think the unique and versatile design and feature of the Lenovo Yoga Tablet fits my requirements to the T.
This post is part of contest ' BETTER WAY' organized on Indiblogger by Lenovo Yoga Tablet. Have just one more game to finish ... please! My home turns into a Kurushethra when my 3 nephews and 1 niece comes over. The tablet is very handy. Good that Farheena learnt to use it for chatting with friends. 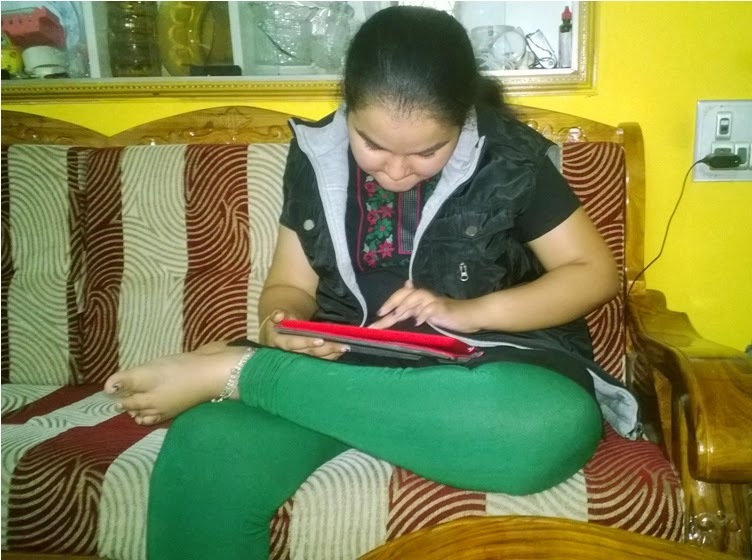 She has learnt a lot more use for her tablet which has benefited her in many ways. This gadget has been a blessing for us. Indeed a boon for kids. 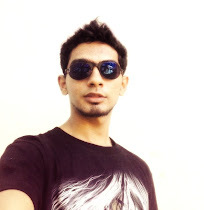 Loved the pics shared :) I know how addictive it can be. So glad that it helped Farheena. Belated congrats on that prize. Wishing U good luck now too ! Hope she gets a Better tablet and Wyfi and data sharing are something I would love to have too ! Thanks Afshan. My tablet is from 2010 or 2011 I think. Good post :).. All the best for the contest.. Thanks for sharing such useful information. You're is the second article, first is http://www.tabletpc-zone.com/why_is_the_ipad_so_great.html that given me an insight to know which is the best pc tablet.